Thank you for tuning in this week! I am back from a whirlwind week at ANWG in Victoria, BC. We camped while at the conference and I had the chance to take a 3-day intensive workshop on Ancient Fibres, which focused on the bast fibres. We spun a variety of fibres and I share some of what I bought in the marketplace at the festival. It was a great weekend, although it left us all tired and drained – time for some rest! Thank you to returning viewers and Patreon subscribers of the show – you keep the show on the air month after month. This week, I share my finished handspun socks with you, as well as some new socks I’ve cast on. I don’t have any of the bobbins handy that I’ve been working on but I will have them for the Live Streaming next show. Enjoy the show! Tour de Fleece starts in just under 10 days! I hope you will consider joining and grabbing a Ravatar from the group – all the information is here! 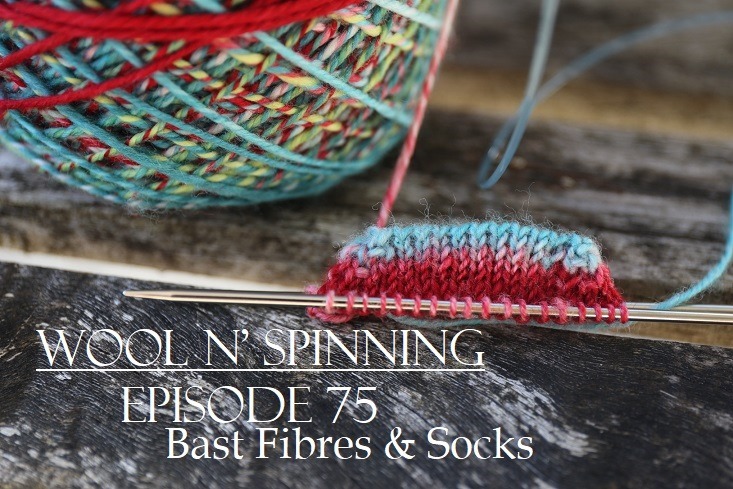 The most recent episode of Wool n’ Spinning Radio has been released for Early Bird Access holders – if you are a Patreon subscriber, remember you can cut and past the RSS feed into your favourite podcast app. I hope you enjoy my conversation with Natalie Redding this month! There will be a bonus episode of Wool n’ Spinning Radio that will be released to everyone this week as well – please watch for that! Ravelry Group can be found here – please join! We reached1000 members and there was a giveaway this week to honour this massive milestone – congratulations to Sarah of Sarah Elizabeth Fibre Works! Don’t forget to contribute to the Gorgeous and Inspiring Handspun Bundle on the Ravelry group to keep each other inspired! Have a pattern you particularly like for handspun? Contribute to the Pattern bundle here. You only need to be a member of the group to contribute to bundles! We have several SPAKALs and spin-alongs (SALs) happening in the group – Our yearly #zerotohero2017, our Stashdown SAL and our current Breed & Colour Study. Please join anything that calls to you! If you are wondering about something specifically, please don’t hesitate to contact me by leaving a comment below!